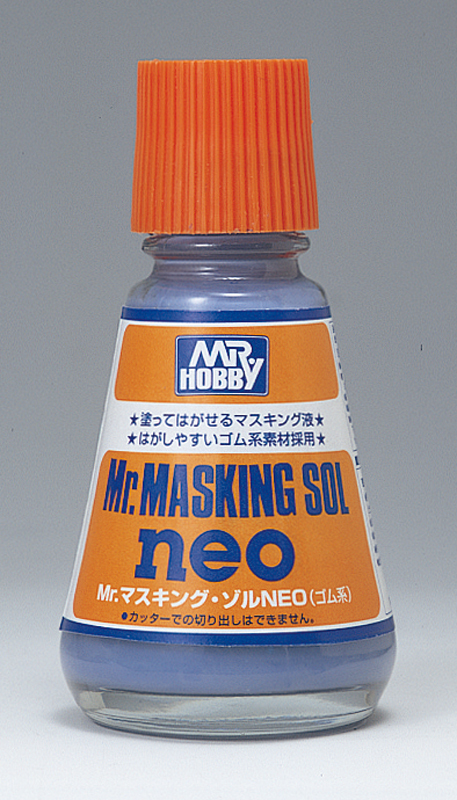 "MASKING SOL", which can be applied, cut and peeled off. This is a water-soluble product, so when it thickens during usage, you can thin it out with tap water for extended use. *Apply MASKING SOL where you need it evenly with a brush. *After it dries within 20~30min., it becomes translucent film. *Cut unnecessary parts away neatly with a design knife, etc. leaving masked parts, and then apply paint. *When the paint has dried completely after painting, peel off MASKING SOL. *MASKING SOL is water soluble, so wash out brushes with water. MR. MASKING SOL NEO ES UNA SOLUCION ENMASCARADORA. APLIQUE, CORTE Y LEVANTE. SOLUBLE EN AGUA. PUEDE ADELGAZARLA CON AGUA PARA ALCANZAR AREAS DIFICILES. MODO DE USO: 1. APLIQUE. 2. DEJE SECAR POR 20 A 30 MINUTOS, LA SOLUCION SE ENDURECE. 3. DELIMITE EL AREA A PROTEJER CORTANDO EL EXCESO DE ENMASCARADOR CON UNA NAVAJA FINA. 4. PINTE LA SUPERFICIE Y DEJE SECAR COMPLETAMENTE. 5. "PELE" EL AREA PROTEJIDA JALANDO LA PELICULA DE ENMASCARADOR. CONTENIDO 25 ml.